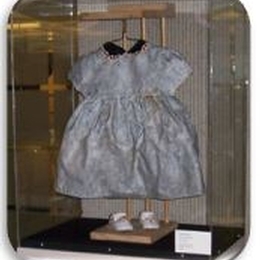 On August 18 the Holocaust Remembrance and Education Committee and the office of the Vice President for Advancement sponsored a dedication ceremony for "The Last Dress," by Rachel Leathers, winner of the 2007 Max May Memorial Holocaust Art Contest. This contest, sponsored by Renate Frydman, director of the Dayton Holocaust Resource Center (DHRC) in honor of her artist grandfather - a Holocaust survivor - is open to Dayton-area students in grades 5-12. The Sinclair committee and the DHRC have worked closely together since the 1980s, sponsoring several annual campus events in commemoration of the Nazi Holocaust and to raise awareness of the dangers of hatred and prejudice. Rachel Leathers was a 14-year-old student at Chaminade-Julienne when she won the contest, and is now studying art at the Savannah (Georgia) College of Art and Design. "The Last Dress," she says, was inspired by thoughts of the million and a half children who died in the Holocaust, often transported to death camps with nothing more than the clothes they were wearing. The dress is on display at Sinclair, on the library loggia.